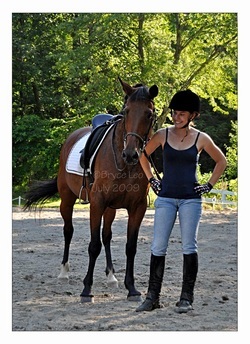 Both individual training rides and full training board are available for horses of all levels, ages, and abilities. I am happy to start your young horse, school your broke mount, or even put show miles on your horse. Training can be incorporated as part of regular lessons, or as a stand-alone program. Remedial horses and green horses of all ages are welcome. Gaited horses and standardbreds are encouraged to try our program! I specialize in building a solid foundation for a quiet horse, as well as filling in training gaps on horses who are displaying behavioral problems, from general spookiness to evasive behaviors such as bucking, bolting, and refusing jumps. Have a horse who won't trailer load or cross water? I can help! Full training board includes excellent care at a facility with access to a round pen, indoor arena, full jumping course, standard-sized dressage arena, and miles of trail access. Horses are taught to bathe, clip, load, stand tied, pick up their feet, round pen, lunge, and long line. Under saddle, horses learn to stand quietly for the mounting block and walk, trot, canter quietly and softly in both directions before incorporating discipline-specific tasks such as trail riding, lateral work, and jumping. Training is pressure-release based and features kind, consistent handling that encourages horses to think, engage, and actively seek the right answers while understanding what is being asked of them. Gadgets and short cuts are not used, and training results stick after the horse goes home. Please email for pricing and scheduling!